Quality air conditioning systems are not like other durable goods that are all ready to perform right out of the box. Getting the intended efficiency, performance and years of dependable operation is dependant upon quality design, installation and start up procedures. Survey and Equipment Selection is the first step in installing a high quality central air conditioning system. Johnson’s can give estimates based upon the general type of system that you have and make equipment recommendations based upon the space served and owner needs. Before finalizing equipment selection we need to survey the space served to assure that the selected equipment is the right system for the space served. Johnson’s recommends that a J Manual heat load calculation be performed to assure the equipment selected matches the real conditions. The existing components are evaluated to confirm that duct systems, refrigerant piping, condensate drains, electrical circuits and equipment supports are adequate to reuse with the new equipment. Measurements are taken for preparation of materials and prefabricated ducts that will be needed to install the system. SYSTEM INSTALLATIONS vary from one application to the next. What may work well for a single family residential home may not be the best installation for a multifamily high rise. Selecting best practices or installation includes using the right techniques for the particular application. SYSTEM COMMISSIONING & START-UP following the installation includes proper preparation of the sealed refrigeration system before refrigerant is introduced into the piping. Multiple evacuations with deep vacuum and purging and pressure testing with dry nitrogen before virgin refrigerant is released into the new system. The system performance is documented and provides a baseline for record keeping for the new system. PERMITS & INSPECTIONS are required and included for all replacement equipment installations in all jurisdictions of Southwest Florida. All permitting and inspection fees are included in the cost of the system. Residential Split System Central Air Conditioning for Single Family Homes. Johnson’s installs new and replacement split system air conditioning systems. For existing homes we usually locate the new split system components exactly where the existing components were installed. For remodelling projects we may assist in selecting new locations when needed. The split system condensing unit is always located outdoors. The indoor air handler may be located inside or outside of the conditioned space ; in SWFL it always preferred to locate the indoor air handler inside of the conditioned space when possible. Your air conditioner is most efficient and performs best when the air handler is located inside air conditioned space. Outdoor Air Handler locations include vented attic spaces and drop ceiling cavities and garage installations where the air handler is suspended below the ceiling or installed vertically on a metal platform. Split System Air Conditioning systems comprised of an indoor air handler and outdoor condensing unit are the most popular application used for residential central air purposes. Inverter Drive Multi-stage Systems adjust their capacity, energy consumption automatically as the real time cooling demand requires. 2-Stage Systems automatically shift between high and low speed operation as needed. Variable speed air handlers are used with 2-stage condensing units. Single Stage Air Conditioning Systems cycle completely on and off by thermostat set-point. Variable Speed Air Handlers can increase the efficiency and effectiveness of conventional single stage outdoor air conditioning condensing units. Carrier offers high quality commercial heating and air conditioning systems and controls. Carrier leads the industry with advanced high efficiency commercial rooftop curb-mounted system sand controls. Carrier systems can be adapted to fit existing roof curbs saving project costs needed for roofing services. Carrier offers a complete line of adaptable solutions to replace and upgrade existing air conditioning systems. Johnson’s technicians utilize factory training and tools to maintain, diagnose and configure AAON equipment. They can digitally connect to AAON systems using a hand-held interface and factory software. AAON is our brand of choice for most 100% outside air systems used for ventilation air for occupants or to provide makeup air for building exhaust systems. Johnson’s goes back to the origin of Florida Heat Pump in 1968. We have used FHP / Bosch equipment to serve our facility on Taylor Rd. In Naples since 1986. We are skilled and familiar with FHP products dating back for decades and are excited about new products, controls and features available in the new product line. Each system is custom configured and ordered. MUNTERS Outside Air Systems utilize large desiccant wheels for the dehumidification process. The desiccant media must be kept clean requiring monthly filter changes. Variable speed fans use heat from the condensers to dry the desiccant media. Johnson’s technicians have vast experience with these mechanical systems and digital control systems. 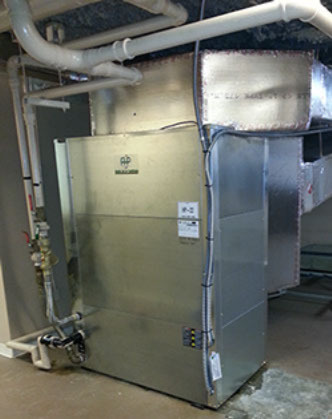 Air Source Split Systems like those used in residential single family homes are also used on most low-rise multifamily condominiums and many high rise condominiums in SW Florida. Outdoor condensing units are located on the ground around the building exterior or on the rooftop. Indoor air handler units are usually mounted vertically in a designated mechanical room or suspended above an electric hot water heater. Air source system in high rise applications have limitations and capacity losses associated with the long vertical length of the refrigerant piping between the indoor and outdoor units. Not all models are capable of operating on the long refrigerant piping runs to lower floors of the building. We recommend the Carrier product line for most residential high rise split system needs. Water Source Heat Pumps are used in luxury high rise condominiums that are connected to a cooling water circulation system and outdoor cooling tower. There are no refrigerant piping length limitations. Water source heat pump systems can be located anywhere within the building without compromise. Water source heat pumps have dehumidification capabilities not possible with residential split system products ; more precise humidity control is possible.